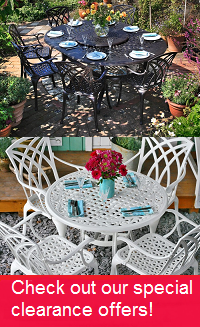 Our specialty here at Lazy Susan is garden furniture made from high quality sand cast aluminium. We have a superb range of metal garden furniture to meet all requirements. We stock everything from garden benches, side tables and 2 seater garden bistro sets right the way up to garden furniture sets for 10 people or more. Take a look through our range below. We’ve provided some convenient filters so that you can quickly find what you’re looking for. If you already have a size, shape or colour in mind, click the appropriate option and you’ll find what you’re looking for more quickly. If you can’t see something that suits you, give us a call! Our friendly and knowledgeable team is always happy to chat to you about what you need and make some suggestions. Our quality aluminium furniture stands out from other kinds of outdoor furniture primarily due to its weather resistance. Unlike wrought iron, cast iron and steel, cast aluminium garden furniture will not rust. Unlike teak and other wooden furniture it will not rot, warp or splinter. You may well have experienced the hassle of maintaining other kinds of metal outdoor furniture or wooden furniture. Frequent sanding, painting and a cover are all needed to protect your garden table or patio set from the worst of the elements. The cost adds up. This makes aluminium patio furniture the smart and cost effective choice if you’re looking for weatherproof garden furniture. Your aluminium garden furniture is practically maintenance free, needing only a wipe over with a clean, damp cloth to clean it. That’s it! No sanding, varnishing or covers necessary. Keep your furniture outside all year long without having to worry. Our aluminium garden furniture sets come in all shapes and styles. The vast majority of our models come in multiple colours, including white, black, slate grey and antique bronze. If you aren’t sure which would look best in your garden, you can request a sample. Our range of aluminium garden tables has oval, square, rectangular and round models on offer. We have a number of extendable garden tables too. These are a great option if you’re looking to limit the amount of space your garden table takes up, but still seat a few extra guests when needed. Many of our large garden tables can fit a Lazy Susan. These wonderful turntables are a fantastic addition to a table that’s going to be used for meals outdoors. They allow you to easily pass nibbles, sauces and dips around the table, so your guests don’t have to lean over each other to get food or drink. Our garden table sets can be purchased in combination with a number of different chairs. Generally, the chic April chair is our default option. If you like the style of some of our other options: the elegant Emma, the Maria, or the gorgeous Kate chair, you can choose to combine these with your new table instead. You can swap in one of these alternatives at a cost of £5 - £25 per chair. The same is true of our modern range. These pieces bring a sleek, contemporary look to your garden and outstanding weather resistance thanks to their cast aluminium body, tough glass table top, and durable outdoor mesh fabric. When viewing our garden furniture sets you will notice that we offer fantastic discounts on accessories that compliment the set, if you combine them with your main order. Get up to 70% off on parasols and seat cushions in various colours, accessorise your furniture set for a sensational price. Of course, furniture sets are not the only thing Lazy Susan has to offer. If you’re looking for garden benches, side tables, sun loungers, parasols and bases or even indoor dining tables, then you’re in the right place. These ranges of furniture also feature wonderfully designed, high quality pieces in cast aluminium. The parasol bases are made from cast iron so that they’re heavy enough to serve their purpose. The parasols themselves are made with fibreglass spokes and fast-drying, waterproof acrylic fabric. We offer free delivery on all of our garden furniture, so when you get to the checkout page there won’t be any extra charges. You can enter delivery preferences on the checkout page too, in the “comments" box. We’ll pass these on to the courier. Certain orders can even be tracked in real time on our courier’s website. Upon request, they can also keep you up to date regarding the delivery status via text message notifications. Our delivery information page has more details. Our friendly customer service team is always happy to help. Whether you want to learn more about our various models of metal patio furniture, or would like details about the delivery procedure, you are welcome to give us a call on 01243 717197, or send us an email at [email protected]. We try to answer all emails within 2 hours during office hours, daily from 08:00 to 18:00.